The Art-Net protocol is a widely known standard to transfer DMX512 over Ethernet (network). This chapter describes how Art-Net can be used to connect your PC that runs the MADRIX software to the MADRIX PLEXUS via network cables to output DMX data. 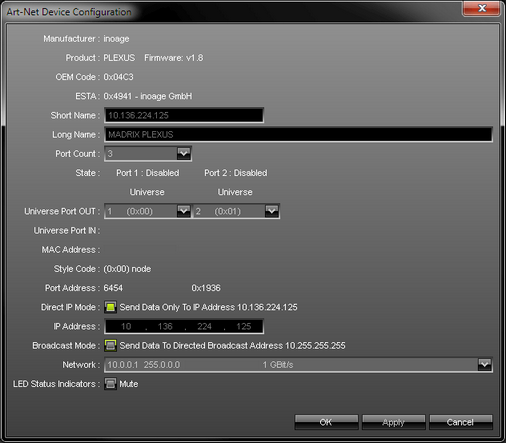 DMX data is then sent to the device over Ethernet/network. Now, please connect the MADRIX to your computer using the network connection. Your device can be powered via the USB port or by using the external power supply. Please make sure that the network settings of your operating system and the settings of your PLEXUS device are correct! To configure the IP address, subnet mask, and standard gateway of your device, go to the PLEXUS menu 'Network' > 'IP Address'. Or use the PLEXUS Configuration window in MADRIX. In Windows, please navigate to the corresponding item to change the network settings of your operating system. It is recommended to use this address area. Please note: Recently, the 2.X network range has been made public. That is why MADRIX PLEXUS will have an IP address in the 10.X address range when shipped. Navigate to the menu 'Network' > 'Art-Net'. 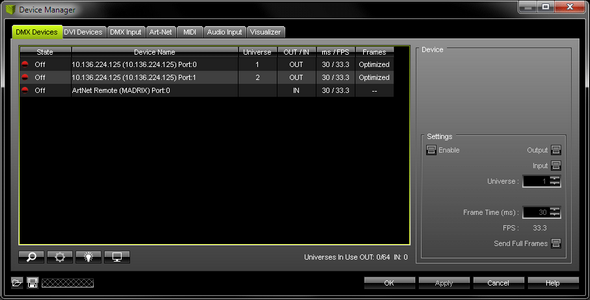 In this menu, the current settings regarding Art-Net, a network protocol for DMX-over-Ethernet, are shown. More specifically, this menu contains the universe settings. Technically speaking Art-Net universes range from 0 to 255, but they are displayed on the PLEXUS and in MADRIX from 1 to 256. 'Art-Net -> DMX 1' sets which received Art-Net universe is sent to the first XLR port for DMX output (DMX 1). 'Art-Net -> DMX 2' sets which received Art-Net universe is sent to the second XLR port for DMX output (DMX 2). 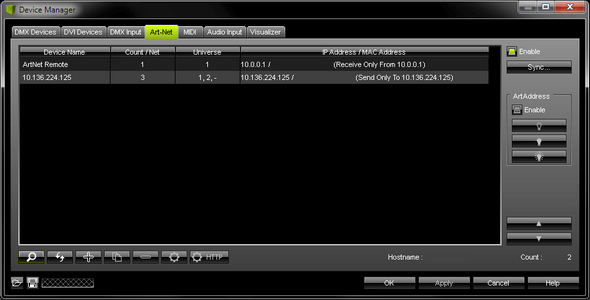 'DMX 1 -> Art-Net' is used for Art-Net output from stand-alone playback. It defines on which Art-Net universe the SD card data for port DMX 1 is sent. In this way, it routes the data from DMX 1 to the specified Art-Net universe. 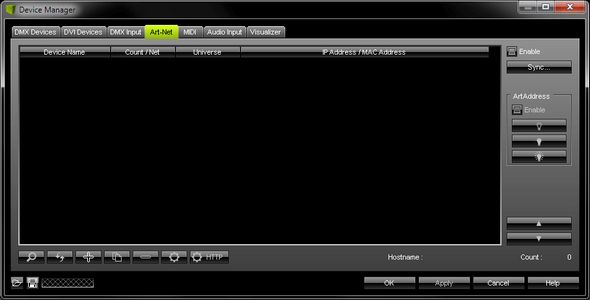 'DMX 2 -> Art-Net' is used for Art-Net output from stand-alone playback. It defines on which Art-Net universe the SD card data for port DMX 2 is sent. In this way, it routes the data from DMX 2 to the specified Art-Net universe. Please change the Universe according to your requirements or deactivate the option by choosing 'Off'. 'Art-Net -> DMX 1' and 'Art-Net -> DMX 2' specify if incoming Art-Net data is routed to the corresponding XLR port (DMX 1 or DMX 2) and which Art-Net universe should function as source for each port. 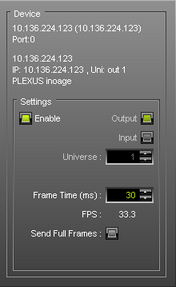 These settings should be activated if you want to connect your MADRIX PC to your PLEXUS device using network cables. In Live Mode, you would then send data over the network to the PLEXUS and the PLEXUS outputs the data to each XLR port, where your LED fixtures, LED controllers, or LED drivers would be connected. 'DMX 1 -> Art-Net' and 'DMX 2 -> Art-Net' specify if the corresponding XLR port is used and if those incoming values should be broadcasted to the Art-Net network and to which Art-Net universe it should be sent. This means, the PLEXUS runs a Stand-Alone show and the data is sent over network (via Art-Net) directly to the LED fixtures or you could convert the data to DMX again using a signal converter. Data will be sent over Art-Net to the configured Art-Net universe via Broadcast according to the configured IP address and Subnet mask of the device. This could also be data from "Test Sending" (see below). For more information about Art-Net output, see the chapter Art-Net (Output). In MADRIX, navigate to the menu 'Preferences' > 'Matrix Generator...' or 'Preferences' > 'Patch Editor...' for this task. For more information, please read the MADRIX Help And Manual. In MADRIX, please navigate to the menu 'Preferences' > 'Device Manager...' > tab 'Art-Net'. Activate 'Enable' in the upper right corner. The checkbox will light up green, when activated. Click this button to let MADRIX automatically find your device. Your device will be shown in the list. Art-Net is now activated. But you will still need to configure DMX output, as described below. In MADRIX, navigate to 'Preferences' > 'Device Manager...' (or press 'F4'). Open the first tab 'DMX Devices'. This window shows your connected devices. 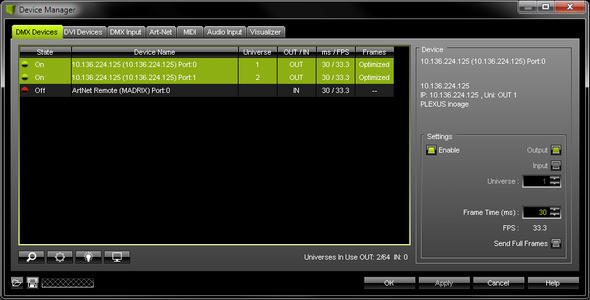 Two list entries will be created for your PLEXUS device and Art-Net, one entry for each DMX port. At this stage, both ports are deactivated. Please activate 'Enable' for every DMX port now. To do so, select a list entry and activate 'Enable'. Click 'Apply' afterwards. Please activate the option 'Enable' for both ports, if required! Make sure that this configuration match the settings of your virtual LED matrix in the Patch. You can also define the 'Frame Time' in ms for each device. allows you to set up further settings. For more information, see below. activates/deactivates the highlight mode for the selected device and universe. Select one or more interfaces and click the button. The corresponding fixtures connected to the selected interface(s) will completely light up white for a better identification. This makes it easier to see them on stage. It considerably speeds up the procedure of programming the selected DMX512/Art-Net interfaces. Switches off all built-in status indicators of a device over Art-Net. MADRIX PLEXUS supports this feature. Allows the built-in status indicators of a device to operate normally again, after having them switched off. You may want to configure further settings for Art-Net. This button in the 'Device Manager', tab 'Art-Net' or in the Device Manager, tab 'DMX Devices' allows you to configure further settings. The following window 'Art-Net Device Configuration' will be opened. 'Broadcast Mode' will send data to all devices in the network. 'Direct IP Mode' will send data only to a specific address and in this way a specific MADRIX PLEXUS. An automatic sync mode for Art-Net devices is implemented in MADRIX. In this way you can activate or deactivate the usage of sync packages. This Sync Mode is not conform to Art-Net. To work properly it needs to be implemented by the manufacturer. It is recommended to activate it for MADRIX PLEXUS. Before activating sync, make sure that all activated Art-Net devices are available in your network! Else, the frame rate of Art-Net might drop. If you are not sure, do not enable any sync mode. In MADRIX, navigate to the menu 'Preferences' > 'Device Manager...' > 'Art-Net'. Click 'Sync...' and a new dialog will open. First, select the correct network in the list. Second, activate 'Enable'. Third, choose if you want to activate sync packages to be sent before data is sent ('Pre-Sync'). Or you can send sync packages after Art-Net data has been sent ('Post-Sync'). Then, click 'OK'. If you want to disable sync mode, click 'Sync' again, select the network, and deactivate 'Enable' again. Then, click 'OK'. This button allows you to control your device remotely with the help of a web browser. For more information, see Remote Control.